The Leafs drafted a dynamic offensive, talent in Mitchell Marner with their 4th overall pick and he is now a foundation piece for the Leafs going forward. While he’s not McDavid or Eichel, Marner carries plenty of skill and plays with pace. He’s more likely to slide to the wing at the NHL level, but has played C for the London Knights in the OHL and there’s potential that he could be there if he’s able to add on some mass. Unlike many elite offensive producers, Marner is good in his own end using his vision to anticipate where opponents will pass the puck and using his quick stride to get there first. The Leafs were scheduled to pick at #24, but traded the pick down to the Philadelphia Flyers in return for pick #29 from the Braydon Coburn trade and pick #61 from the Kimmo Timonen trade. The Leafs than again traded down with Columbus turning the 29th pick to get their own 2nd round pick (traded in the Jonathan Bernier and Marian Gaborik trades) at #34 and the 68th pick the Flyers had in round 3 which Columbus acquired previously for Steve Mason. In the early parts of the second round it seemed everyone wanted to grab the biggest guy possible, but the Maple Leafs stuck to their own plan and grabbed Travis Dermott of the Erie Otters. Dermott isn’t exactly undersized at 6’0”, 196 pounds and he posted exceptional numbers for the offensive Otters. Dermott was a prime example of what a new age defenceman in the NHL is: exceptional skating and puck handling to go along with strong vision and outlet passes. Defensively, Dermott has good reach and uses his IQ to jump at players when they’re in bad spots. He rarely forces a play on either side of the puck and his numbers should be interesting to track next year as he won’t be able to pick up easy assists on outlet passes to Connor McDavid, but the left handed defenceman seems like a safe bet to be an NHL player with second pairing upside. Jeremy Bracco broke Patrick Kane’s record for assists with the U.S. National Development Team and was among the top scorers last year at the U17's and this year at U18's on his way to gold medals at both tournaments. The most underrated part of Bracco’s game is his shot as he posted 30 goals last year for the USNDP, but almost always has his playmaking ability talked about. Defensively he needs some work, but slated to go to Boston College starting in the fall of 2015 he will have time to work on it or he could develop in the OHL if pushed to Kitchener by Dubas and Hunter. More the old style NHL d-man than Dermott, Andrew Nielsen, is a bit of a bullish defenceman that is physically solid. He’s an imposing figure and scares off opponents with the threat of crushing hits. A solid passer and a hard shot, Nielsen needs to improve his skating to be able to get to the next level, but could make a nice partner for a more offensive-minded defenceman down the road. A pick that took many by surprise, Martins Dzierkals, plays in the KHL development league as well as a U18 club in Latvia. Dzierkals also suited up at the U18 leading a surprising Latvian offense with three goals and six assists in six games played. He also represented Latvia at the U20 Division 1 Championships playing five games and posting a pair of goals to go along with a pair of assists on the way to a 3rd place finish. His stats are impressive, but he needs to add some size at only 170 pounds before coming to North America. Dzierkals was considered a potential first round pick in the CHL import draft which occurs on the 30th of June and no doubt the Leafs would love for him to develop in their own backyard. Jesper Lindgren, at only 165 pounds and 6’0”, is a dynamic skater and puck carrier that shows a lot of confidence making plays not many else would - this doesn’t always work out however so he’ll need to pick his spots better. Good anticipation and awareness, but without much of a body to battle with Lindgren uses his stick well to break up offensive plays in his own end and start his team’s offence in just a few seconds. Got a taste of playing against men this year in the Swedish Hockey League with four games and one assist. The Leafs were slated to make pick #107 of the 2015 drafted, but as the Stars selected Chris Martenet of the London Knights at #103, Kyle Dubas quickly picked up the phone to talk to Peter Chiarelli to bring in former 2nd round pick Martin Marincin. The final deal became the RFA rights to German-bound Brad Ross and pick #107 for the RFA rights to Martin Marincin. At 6’4”, Marincin, is a big guy however, but at the age of 22 a lot of questions exist about whether or not he really wants to put in the work to get to the next level. Marincin has 85 games of NHL experience under his belt over the past two seasons playing parts of the least five seasons in the AHL for a total of 128 games. At the NHL level he’s scored one goal and added 10 assists while playing limited minutes. Marincin could still fill out his potential of a top four defenseman however a bottom pairing guy is a safe bet. D.J. Smith may be going to the Leafs next year and one of his most heavily leaned on blue liners, Stephen Desrocher, will be joining him down the line. Desrocher was passed over in his first draft year, but put up good numbers in his second year playing an extremely sound defensive game to go along with a booming shot from the point and good size. He uses his size and skating well along with his physical play to separate opponents from the puck and is able to get a quick outlet pass up to teammates. Might not even be a top pairing guy but a reliable 3rd pairing guy seems likely. This was a shocker to me as I didn’t expect this guy ranked in the late second or early third by almost every service out there to fall all the way to #185 but he did so be happy Leafs fans. Nikita Korostolev is a great skater who plays a puck possession game with a lot of skill mixed in. He’s involved physically, can score, and makes passes that not many others can. Needs to work on his defensive game however but could be, behind Marner, the Leafs most dynamic player from the 2015 draft class. The Leafs made some picks that people will look back on in a couple years in amazement given the skill they have, however drafting a player who would likely end up at centre at the NHL level would have been nice given the team’s lack of depth at the positions in the prospect pool. Not drafting a centre isn’t a cardinal sin however and the Leafs and their fans should be thrilled with what they came a way with from the 2015 NHL Draft. 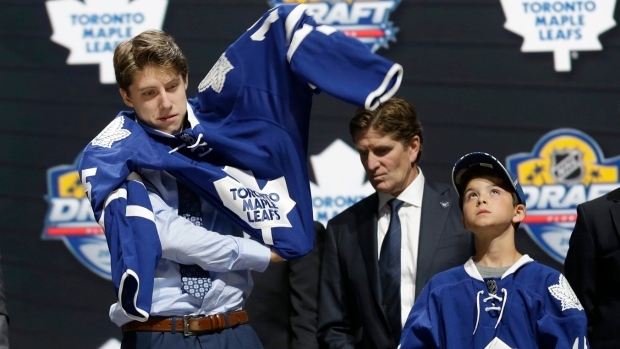 Everyone was pretty excited about how the Leafs drafted. But still we are years away from seeing what these kids will become. thank you for your sharing information.